Rochester, NY - Semrock, Inc. announced the release of its new 116-page, 2013-14 Master Catalog of optical filters and related products. 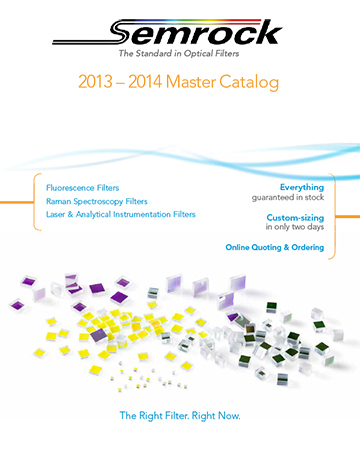 This comprehensive catalog contains the latest products introduced over the last six months including over 40 new or improved thin-film filters for fluorescence microscopy and measurements, Raman spectroscopy, and other laser analytical instrumentation applications. Among the standouts of this print edition is the expansion of the industry-leading high performance RazorEdge® “E” grade product line. These ultra-steep long-pass edge filters are designed to provide deep blocking at the laser wavelength, then quickly transition to high transmission in less than 0.5% of the laser wavelength (e.g. <2.7 nm for a 532 nm laser). These nine new wavelengths expand upon the six filters currently available, offering customers a total of 15 wavelengths to select from. Other popular products now offer additional standard sizes to reflect customer requests. New in this edition are the 50 and 50.8 mm diameter ultra-broadband MaxMirrors®, which are also available in bulk packs of ten for the 12.5 and 12.7 mm sizes. High extinction (1,000,000:1 contrast between p & s-polarized light) polarization bandpass filters are now offered in a 25 mm diameter, conveniently sized to fit into popular laboratory mounts. Exceptional Semrock services highlighted in the catalog include our same-day shipping policy, two-day custom-sizing, and a 30-day, no-hassle return policy. All Semrock filters are covered under a five-year warranty. Request your free print or PDF copy of the catalog directly from the website. Semrock, Inc., manufactures high-volume optical filters that set the standard in performance and reliability for the biotech and analytical instrumentation industries, as well as innovative optical filters for more general laser and optical systems applications. All Semrock optical filters are made with hard-coated sputtered optical coatings. End-users benefit from a wide selection of standard catalog products that ship from stock. Semrock’s patented and patent-pending products include its highly acclaimed BrightLine® fluorescence filters, state-of-the-art filters for Raman spectroscopy, and other unique filters for lasers and optical systems. Semrock’s innovative products, made possible by combining modern sputtered coating techniques with Semrock’s proprietary volume manufacturing technology, are covered under a five-year warranty. Founded in September 2000, Semrock is based in Rochester, New York, a well-known center of optics, and has sales offices throughout the United States. Semrock joined IDEX Corporation in October 2008 and is a brand under IDEX Optics & Photonics platform.